Extreme music appeared with some delay in Eastern Europe. Bands in this area had to face with the same difficulites in the early and mid '90s like Western or South American bands had to almost one decade earlier. The difference was: their names remained more or less unknown for the main scene. As a veteran band of the Polish underground scene, Cryptic Tales had a demo tape that was so to say precocious for a demo. 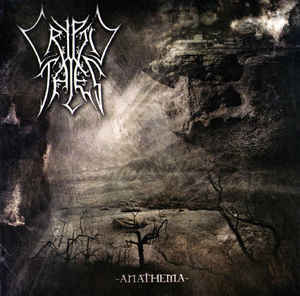 Many bands would be glad to produce the same quality for a full-lenght album that could be heard on "Anathema". On the side of the old school extreme ambitions, experimenting features were show up which gave some new tone to their music. They tried to emphasize the heaviness of their themes and they tried that with common slow downs and strong atmosphere. These slow downs made "Anathema" one of rare Death/Doom records of those times which style was everything but popular. Small ideas could spice up things well. The short classical string instrument (probably double bass) and acustic parts gave an awesome atmosphere to the main view. It's melancholic and heavy the same time, shows a great contrast with the ordinary death metal features and creates balance with the doom influences. And of course proves how well composed this demo was.